Research for this book encompassed areas that few educators involved in beginning reading venture into. As the evidence mounted, it became very clear that merely tweaking the existing system will never solve our literacy problems because of dramatically changed conditions in the last ninety years. The writings of numerous linguists and educators over the last two hundred years, however, built an increasingly convincing case that there IS a solution to our literacy crisis. The extreme importance of — at long last — permanently solving our literacy crisis, instead of merely attacking one or more of its symptoms (as virtually 100 percent of all solutions proposed in the last thirty-five years have done), demands an urgent appeal to every reader to honestly and open-mindedly consider all the evidence presented in this book. Several centuries of history clearly demonstrate that governmental leaders in English-speaking nations seldom initiate the revolutionary teaching method that has been proven effective in hundreds of other countries (but never tried in English) to solve our literacy problems. Governmental leaders almost never institute revolutionary changes unless pushed into them by the public. We, as concerned citizens, must initiate the changes needed to solve our literacy crisis. The data presented in Chapters 1 through 5 from numerous expert observers of our culture will convince any open-minded reader that our illiteracy rate has now reached crisis proportions. Several linguistic and educational experts say that with the present system of teaching reading in U.S. schools, some students — even some of our brightest students — will never become good readers. As linguistic expert Sir James Pitman states, “the [reading student] is expected to take on a task that is formidable for all and for some impossible.” (See the section titled “Why It Is Difficult for All, Impossible for Some” in Chapter 6 for the full quote.) No one knows how many people will be unable to learn to read English without extensive one-on-one tutoring, but with more than 1.3 billion English-speaking people in the world, it is at least hundreds of thousands too many — especially if it includes one of your loved ones. There are basically two ways in which a non-fiction book such as this can be read. As a result of real or perceived time pressures, readers can scan through a book to see what it is about in order to decide if they want to read it or not. As a result of scanning here and there they may choose to read a few sections a little more carefully. The other method of reading a book is to begin at the first and read consecutively to the end in an honest attempt to determine the important ideas to be learned. Although what this book proposes is very simple, the reasons for the proposals are so complicated and the importance of at long last solving our literacy crisis is so great that it deserves a diligent effort to gain a complete understanding of both the problem and the solution — which can best be obtained by reading it consecutively. Although this may seem to be a very long book, the text is fairly short (only 164 five in. by eight in. pages in the print version). The appendixes are included primarily for linguists and persons wanting additional information about the English language — and to thoroughly inform any skeptics who may happen in. More than twenty-five years of research has gone into the preparation of this book. Numerous linguistic and educational scholars for more than 250 years have recommended the solution to English illiteracy proposed in this book and have thoroughly refuted their skeptics. One of the most convincing rebuttals of the skeptics was by Thomas Lounsbury, LL.D., L.H.D., English professor emeritus of Yale University, published in 1909. You can read his archived book for no cost at http://www.archive.org/details/englishspellings00lounuoft. Frank Laubach, perhaps the best teacher of adult illiterates of all times, taught adult illiterates around the world in more than 300 languages, many of which were not written languages until he devised a written language for them. He prepared reading primers for 313 different languages. He found that in almost every language, except English — in 98 percent of the 300 languages (295 of them) — he could teach them to read fluently in less than three months. In 95 percent of the languages, adult illiterates could be taught to read fluently in from one to twenty days. In some of the simpler languages, such as some dialects in the Philippines, he could teach them to read in as little as one hour! The shorter learning time in other languages is NOT a result of English being a difficult language to learn. The grammar and syntax of English is neither the easiest nor the most difficult to learn. It is easier, for example, than many European languages, nearly all students of which learn to read in less than three months. More than 1.3 billion people around the world speak English, either as a native- or a second-language, but millions of them cannot read English very well or at all. There are more than 93 million adults in the U.S. alone who are very poor readers, as Chapter 2 will document. The purpose of the book is contained in the title. Yes, it IS possible to end our literacy crisis if the method proposed in this book is used — regardless of what the naysayers may claim and regardless of whether or not the method goes against conventional wisdom. Conventional wisdom may be defined as ideas or beliefs that a large number of people — perhaps the majority — agree upon. The fact that a large number of people believe something does not make it true, however — even if almost everyone believes it. At one time almost everyone believed the earth was flat. When people do not want to be bothered with too much change in their lives they may say, “We’ve already tried that — it doesn’t work” often merely assuming that it must have been tried at some time in the past. There are many responses to the statement “we’ve tried that; it doesn’t work” as applied to this book. Two will suffice. First, there are those who will be unable to resist the temptation to scan through later sections only long enough to decide quickly what they think is being proposed. Even if what is proposed here were exactly what the scanners think (and it will not be unless they know the details), the conditions have changed in the last ninety years or so and the need is much greater now. Second, the method proposed has never been tried in English. In other languages it has not only been tried, but it has been successful in improving literacy — in nations both larger and smaller than the U.S. and in both advanced and in Third-World nations. As this book explains, English-speaking nations can reduce the money they spend teaching their students to read English by doing so in less than three months (instead of the present two or more years) and by replacing students’ reading books only when they physically wear out — rather than every three to five years, when the “reading experts” come up with their latest theories of how to improve the teaching of reading. All that is required is an understanding of the seriousness of the problem and the method proposed to solve it. When that understanding is achieved, the readers will want to join others who understand and begin a grass-roots campaign concerned with solving our literacy crisis. Tom and Cindy were proud of their apartment. It wasn’t much, but it was the best they had ever been able to afford. Their two young sons finally had a place to live and thrive. They had moved in during the summer two years ago. Emily, the new joy of their life, was a happy, healthy three-month old. Now it was winter and bitterly cold outside and they have been evicted — not for nonpayment of their rent but, according to the manager, because Emily’s crying had disturbed the neighbors. The manager told them their rental contract allowed tenants to be evicted if neighbors complained about another tenant’s noise. His real reason was that he planned to renovate the apartment and raise the rent to an amount he knew Tom would never be able to afford. But Tom and Cindy didn’t know. They couldn’t read the contract — or much of anything else. They suspected that the manager was lying, but they so dreaded being exposed as illiterate that they would not protest and have their illiteracy made known to a few friends they had made in the nearby apartments. Instead, they meekly sought shelter in the downtown rescue mission again until they could find another, very scarce, low-rent apartment. George was their best janitor. He had worked for the cleaning company for four years and was so willing to do any job that the common expression, “Let George do it,” definitely applied to him. Even though he hated working the night shift, he was a hard worker because this was the first job he had been able to find to support his family in over two years. But now, George has just been fired. His boss left him a note giving him special clean-up instructions. George can read a few words but could not read enough of the words in the note to do the job he was so eager to do. The three children sitting around the table are crying. Jane, their mother, is so exasperated, she feels like crying too. 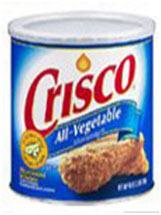 After opening the large can of Crisco she just brought home and excitedly placed upon the table, she had to explain to her hungry children that it does not contain the fried chicken pictured on the front. Jane cannot read. Like many in her condition, when she returned from the grocery store, the meager wages she earned at her low-paying sewing job were gone. There is nothing left to go back and buy something to cook in her year’s supply of Crisco. Frank and Jenny usually didn’t stray very far from home. They could not read the street signs and highway markers very well and often feared getting lost, but this was a special occasion. Their only child was celebrating his seventh birthday. His adoring parents agreed to take him to the county fair in a nearby town a few miles from their home on the Great Plains. There were very few towns in this rural area, but friends had told them how to get to their destination. After driving for what seemed like a very long time, they realized that the directions they had been given was inadequate. They were running very low on gasoline and their son began having another of his frequent attacks of asthma. To their horror, his medicine did not help the situation. There were no houses or businesses in sight. They had brought their cell phone and knew how to dial 911, but they did not know how to read the street signs and highway markers well enough to explain their location to the emergency operator. These and hundreds of similar stories occur around us every day, but we usually do not see them. There are several reasons this is true. The most frequent reason is that, as a result of shame and embarrassment, those who are very poor readers are extremely good at hiding their condition. In fact, in the most extensive study of illiteracy ever commissioned by the U.S. government, almost all of the adults in the two lowest of five literacy levels claimed, when asked, that they were good readers or very good readers and had little need for help with tasks requiring reading. If you have any doubts about how well illiterates can “hide in plain sight,” two fairly recent books should dispel that doubt forever. The 1998 book by Tom Harken, The Millionaire’s Secret tells how he became a millionaire even though he could hardly read at all. 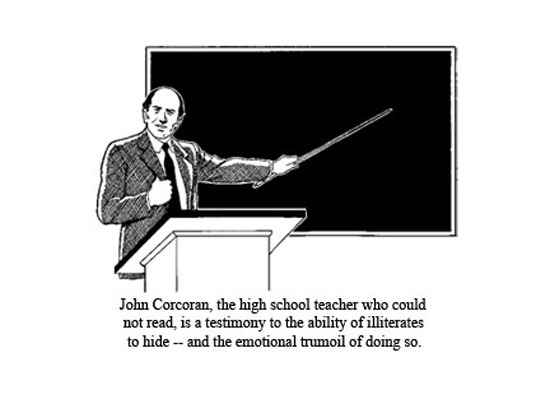 Even more amazing is John Corcoran’s 1994 book, The Teacher Who Couldn’t Read. See the section “The Hidden Illiterates Among Us” in the next chapter. Another reason we do not see more evidence of illiteracy is that the zoning laws in most cities keep the homes segregated according to price level. Although adults who are functionally illiterate occasionally manage to advance to a high-paying position, unless another adult in the household can add enough to the family income to enable them to afford a more expensive home, adults who read very poorly live in a different neighborhood than those whose residents are mostly fluent readers. Millions of non-readers and poor readers continually endure a multitude of problems and life-threatening dangers besides those shown above. Jonathan Kozol, in his book Illiterate America, gives a fuller explanation than is presented in this chapter. A thoughtful, sensitive person cannot read this book or Kozol’s book without feeling compassion for illiterates over their physical, emotional, and financial problems resulting from their illiteracy. Kozol gives actual examples of people he knows and loves who have experienced the problems he describes. The method of presenting the data in this chapter requires special consideration. It is important that you consider what effects the problems described in this chapter would have upon you instead of upon some nameless, faceless person you are not sure exists. It is always easier to ignore serious problems if they aren’t happening to us or our loved ones. Unlike the above examples, the following will be a brief, matter-of-fact explanation to avoid overstating the importance of any one problem illiterates must constantly endure and to avoid charges of demagoguery. Keep in mind, however, that many simple tasks we take for granted are beyond the ability of many illiterates. 2. Low pay for low reading ability. This will be explained in chapter 2. 4. Unemployment versus reading ability. See chapter 2. The inability to read well enough to hold a job providing an adequate income is an obvious contributing factor to crime. 12. Victimization of nonreaders by their landlords. Even the most basic needs are more uncertain for nonreaders and poor readers. An apartment to live in and fuel to keep it warm in winter are uncertain if the one signing the lease or receiving past due bill notices can’t read. Even loss of a place to live in winter is not as dreaded as the loss of dignity and self-respect. 13. Lack of understanding of insurance coverage. Insurance policies cannot be used for insuring against losses, the way they should be, for illiterate policyholders. This is true if the policyholders do not remember (or more likely were not told) all the details of the insurance coverage and cannot read the policy for themselves. 15. Democracy is denied to nonvoters and uninformed voters. One of a citizen’s most basic rights is the right to vote. Most illiterates either do not vote or cast uninformed votes. Their knowledge of candidates is usually limited to paid political radio and television announcements and to events newsworthy enough to deserve air time. They usually have no other way of learning the facts about a candidate on issues that are most likely to affect them. They can’t vote on issues that are in their best interests. Democracy, for them, is an unreachable ideal. 16. Loss of citizens’ rights through lack of knowledge of them. Illiterates often do not know and exercise their rights as citizens. They can’t read notices they receive from the Internal Revenue Service or from the welfare office. They must learn of their rights, deadlines they face, and things they must do by word of mouth or from the radio or television. They seldom know all their options. They must depend on people they often have reason to distrust to keep them informed. The rights that are written somewhere as theirs are just a hollow mockery if they don’t know about them. 17. Denial of the right to an education. A common present-day expectation of almost every U.S. citizen is that they will receive a public school education. This, more than any other “right,” is of great importance to illiterates. It is understandable if school officials, after reviewing the records, decide that certain students are wasting a teacher’s time and the school’s budget for school materials. Believing that these students are not worthy of a teacher’s time and are taking up space that more deserving students could use can be devastating to a teenager’s self-respect. Such students drop out of school instead of insisting upon their right to an education. It is easier for all concerned to believe the student has failed than that the educational system didn’t do what it should for the student. In addition, parents, whether they can read or not, often are embarrassed and frustrated over difficulties their children have in school. 18. Children of the functionally illiterate lose educational rights. Children do not receive all the benefits that are due them from the school system if their parents can’t read. Illiterate parents do not read letters from their children’s teachers. Illiterate parents cannot study materials designed to help their children prepare for college, nor can they help their children with homework. They can’t show their children the importance of an education by going to the classroom or by meeting the teacher. They fear they will embarrass themselves or their children with their inability to read or understand basic school subjects. 21. Restaurant roulette: stick to basics or eat detested food. Illiterates can’t always order what they want when they go to a restaurant. They may have to choose by pointing to something on the menu. If there are no pictures, they may not know what they have ordered until it arrives — and it may be something they do not like. They can’t tell from a menu in the window what the price of items will be before they go inside. They must either order something basic they are sure the restaurant will have or depend upon the person they are with to order for them. Their choice is another hamburger and cola or something ordered for them that they hate. 22. Supermarket roulette: what is in this can? Illiterates are denied the choice of less expensive generic or unadvertised brands of food when grocery shopping. They have to buy products based on pictures on the package or buy labels they recognize from TV commercials. Even many nationally advertised brands are beyond their purchase. For example, how could they buy Campbell’s soup and get what they want when every can looks the same? Most illiterates so dread prejudice — a dread that is all too often justified — that they will not ask for help in the supermarket. They therefore waste money on household items they can’t use or on foods they detest. 23. Expense, time, and stress of traveling to pay bills. Illiterates cannot manage checking accounts, so they seldom pay bills by mail. This means they must spend several hours each month in time-consuming and often expensive travel, an added cost for every payment they make. 24. The dangers of travel. Travel is often difficult for illiterates. They endure risks that most of us could never imagine. Although they may learn to decipher many traffic signs and symbols, street signs they have never seen before are a complete mystery to them. Bus stop and subway station names are equally meaningless. Imagine your frustration at being lost in a foreign country with a language you know nothing about. A similar frustration or fear usually keeps most illiterates close to home. 25. Lack of choice of TV programs. Illiterates do not even have the luxury of deciding in advance what TV shows they will watch. They stick with weekly programs they know come on at a certain time. Alternatively, they find what they can by flipping through the channels, frequently missing programs that would be of more interest to them. 26. Inability to follow food preparation instructions. Illiterates can’t follow the food preparation instructions on the items they purchase. They may want to avoid the monotony of always having the same food or the criticism of being a lazy, unimaginative cook. There is a danger, however, in purchasing some new food item or in trying a new recipe by following a friend’s oral instructions. They run a high risk of wasting food for which replacement would be difficult or impossible because of limited finances. Even government food handouts become a mockery. If the recipients cannot read instructions, they cannot make a tasty meal from the surplus cheese, noodles, and powdered milk, for example. 27. The dilemma of having to trust someone who is untrustworthy. There is an obvious outcome of the examples in this chapter. Illiterates do not have even the most basic lifestyle choices that the rest of us have. They must rely upon others to choose for them. Because of their disability, illiterates can cite many times when wrong choices were made for them or times when they were cheated. They find themselves in the dilemma of having to trust people that they are not sure can be trusted. They are often paralyzed by not knowing the right word for the right thing at the right time. It is often a terrifying feeling. 28. Medicine bottle precautions. Illiterates can’t read precautions on a medicine bottle. The expiration date for safe usage, possible allergic reactions, sedative effects, who should not take it, and dosages, thus may be a mystery to them. 29. Inability to read health pamphlets. Illiterates can’t read health pamphlets and bulletins, and thus often do not know about the preventive health measures they describe. They often do not know, for example, the seven warning signs of cancer. 30. Inability to read product warnings. Illiterates can’t read, for example, the warning sign on a pack of cigarettes. They may know that smoking is bad for them, but they can’t read the details that would give them the determination to quit. 31. Unintended surgery through lack of understanding. Illiterates can’t read waivers that they must sign before undergoing surgery, so they don’t know their rights. They often do not understand the medical jargon and fear the unfamiliar atmosphere found in hospitals. They sometimes find, too late, that they’ve agreed to something that in the confusion was not adequately explained to them. Some women, for example, have found that by undergoing an unintended hysterectomy, they have forever been denied the basic privilege of motherhood. 32. Workplace injuries. Working with toxic chemicals can be a frightening job for anyone. It is especially so for someone who can’t read package labels or the warning signs on the walls. 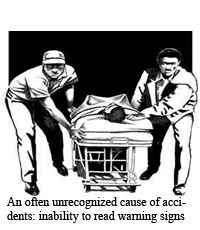 The same is true regarding warning signs about machinery and other dangers. U.S. workers are more likely to be killed on the job than workers in other major industrialized countries (for example, thirty-six times more likely than in Sweden). One out of eleven U.S. workers will be killed or seriously injured at work. How Widespread Is U.S. Illiteracy? This chapter is included for compassionate readers who are upset by what they read in Chapter 1 and who, as a result, want to comfort themselves in the belief that, although the problems and suffering of functional illiterates is real, it does not affect very many people. 2. It included development of an accurate objective means of judging reading ability based upon predetermined absolute standards. These standards measured “functional literacy,” the test subjects’ ability to read and correctly act upon what they read by finding information and performing certain operations upon that information. If compassion for the serious physical, emotional, and financial problems of illiterates and the problems their illiteracy causes those of us who are fluent readers (which will be covered in a later chapter) do not motivate us, there is little that can be done about the first three excuses for inaction. This chapter, therefore, deals only with the last two excuses for inaction above. Anne C. Lewis, a freelance writer on education concerns, says there are “two big problems” the press makes in its coverage of illiteracy. The first mistake is confusing adult illiteracy problems with problems in the public schools. It is typical to blame the adult literacy problems on the schools and then go no further — as if fixing the blame will somehow result in solving the problem. Blaming the schools accomplishes nothing because, she pointed out, roughly 70 percent of the workforce in the year 2000 was already in the workforce and therefore permanently out of public schools. Furthermore, she says, thirty million or more Americans read so poorly they could “bring the whole economy crashing down.” With the rapidly accelerating technology in the workplace and its demands, for example, for reading the operating manuals and for retraining, previous levels of illiteracy are no longer acceptable. She says the press rarely makes this known. An ill-educated citizenry threatens the United States’ ability to remain competitive in world markets more than any of the other more frequently cited causes of unproductive work places. That, according to Geneva Steel President Joseph A. Cannon, was one of the main themes of the prestigious Eighth American Enterprise Institute World Forum he recently attended in Beaver Creek, Colo.
U.S. children rated about 14th out of 15 nations on mathematic Skills. Mr. Cannon said the average IQ of Japanese student is increasing while that of their counterparts in the U.S. is declining. A big part of the reason people do not realize the seriousness of the literacy problem is the way the media handles the reporting of scientific or statistical studies. Since reporters are journalists, not statisticians or mathematicians, and since the reporters are almost always under time pressures to get their report out (before someone else reports it and it is no longer “news”), reporters often read only the Executive Summary of lengthy reports. In any case, journalists seldom do a careful study of the entire report, much less a serious mathematical analysis of data in a study. The 1993 study mentioned above was a 150 page report. The April 2002 version of the report was even longer: 199 pages. In the case of this study, a simple mathematical analysis of the data was required to understand the true seriousness of the findings of the study. The article by the Washington Post writer began the article by stating: “Nearly half of all adult Americans read and write so poorly that it is difficult for them to hold a decent job, according to the most comprehensive literacy study ever done by the U.S. government.” This raised questions of what constitutes a “decent job,” exactly how many people are affected, how accurate was the study, and what were the statistical procedures to ensure accuracy, leading to the author’s “engineering study” of the report. It was found that although the Washington Post writer’s statement was true, in effect it minimized the seriousness of the problem. The Bottom Line: How Bad Is It? * percent of the 191 million U.S. adults in 1993. There was no overall statistically significant difference in these employment figures in a report issued in 2006 by the same group of researchers as performed the 1993 study. Almost every U.S. adult can read at least one or two thousand simple words that they learned in the first three grades in school. If that is all they can read, however, they cannot read and write well enough to hold an above-poverty-level-wage job, which is the most accurate definition of functional illiteracy. There are other ways of deciding that someone is functionally illiterate, of course, but they do not have the financial incentive for being accurate that employers have when hiring someone who will be able to read and write well enough to be a profitable employee. The 48.7 percent of U.S. adults in Literacy Levels 1 and 2 were functionally illiterate. 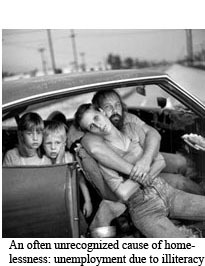 The percentages of U.S. adults shown as “in poverty” on page 61 of the 2002 report were: Level 1: 42.7 percent and Level 2: 21.7 percent. Although all of the average yearly earnings of Level 1 and Level 2 interviewees were below the poverty threshold, they were not all in poverty because of the earnings of another person or persons in the family and, in most cases, because financial assistance from the government, family, friends, and charities brought many of them above the poverty threshold line. Page 61 of the 2002 report shows that the percentages of Levels 3 through 5 adults who were in poverty were 12, 7.67, and 4.67, respectively (averaging the prose, document and quantitative). When these percentages are multiplied by the number of adults in each level, it shows the number of adults in each level who were in poverty. Adding the total number of adults in poverty in Levels 1 and 2 and Levels 3 through 5 and dividing by the total number of adults in those two groupings of levels shows that 31.2% of Levels 1 and 2 were in poverty, but only 10.1% of Levels 3 through 5 were in poverty. Although there are many reasons for poverty, since the report statistically balanced the interviewees by age, gender, ethnicity, location, etc. and since there is no obvious provable differences other than literacy level, if 10.1 percent is taken as being the poverty not resulting from illiteracy and is deducted from the 31.2 percent, the resulting 21.1 percent due to illiteracy, when compared to 10.1 percent, provides strong evidence that illiteracy causes more than twice as many adults to be in poverty as all other causes combined. Literacy experts and educators say they are stunned by the results of a recent adult literacy assessment, which shows that the reading proficiency of college graduates has declined in the past decade, with no obvious explanation. Although there are many definitions of what constitutes functional illiteracy, very few people can afford to accept a job that pays less than they are capable of earning. And although a few people are so insistent upon holding a cherished but low-paying job that they are willing to live in poverty, their numbers are almost certain to be negligible. Very few U.S. adults cannot read at all. Most U.S. adults can read at least one or two thousand simple sight words they learned in the first four grades in school, but if this is all they can read, they cannot read and write well enough to hold an above-poverty-level-wage job and they are functionally illiterate. As the 1993 study amply demonstrates, almost half of U.S. adults are functionally illiterate and, as a result, they must constantly endure the pain and suffering described in chapter 1. It is no stretch of the imagination to call this situation a literacy crisis. Although there are several books in print defending present methods of teaching students to read, appendix 7 is a point-by-point refutation of the only known book published since the 1993 “Adult Literacy in America” report which claims there is no literacy crisis. Appendix 7 is included for those who may have encountered and believed information claiming there is not a literacy crisis. Although the previous section only shows statistics on U.S. functional illiteracy, the same problem exists wherever there is English written material. There are more than 1.3 billion English-speaking people around the world, most of whom have a native language other than English. Even if only 20 percent of them, which is highly unlikely — rather than about 48.7 percent, as in the U.S. — are functionally illiterate in English, that number still adds up to a shocking “hundreds of millions” of people who speak English but are functionally illiterate in English. IF their native language is a written language AND IF these people are fluent readers in their native language AND IF their nation has the financial resources to print an adequate supply of written material in their native language, functional illiteracy — for them — may not be a crippling problem. Unfortunately there are multiplied millions of people who are on the wrong side of these three IFs. There is one “trick” to the figures, if you can call it that, which has already been mentioned: the figures refer to functional illiteracy. If, however, people read so poorly that they cannot get by in life as well as they should, their reading ability is of little value. Besides this explanation of functional literacy, there are six more major reasons why the extent of illiteracy is not widely known. Today there are many who pass as literate, although they aren’t. These people are known as “passers.” We might be surprised, for example, at how many businessmen and others carry a newspaper only to make people believe they can read. Illiterates seldom look any different. Also, you can’t identify an illiterate person by talking with one. Many illiterates are knowledgeable and eloquent speakers. They just didn’t gain their knowledge or eloquence through reading. Passers are significantly helped by real estate zoning laws which essentially keep lower income illiterates separated from higher paid literate workers and by the natural economic and cultural separation that occurs in any group of people. Those who can read are more likely to be close associates with others who can read and vice versa. Anyone who doubts these conclusions should read John Corcoran’s book, The Teacher Who Couldn’t Read. Mr. Corcoran graduated from Texas Western College in 1961 with a degree in education. He admits that he cheated on tests in college — although he states in his book, “I am not advocating cheating.” He had gotten into college without taking entrance exams because he had an athletic scholarship. Amazingly, he became a teacher of tenth, eleventh, and twelfth grades in California, where he taught for eighteen years, without being able to read! He taught social studies, typing, history, physical education, and one year he even taught English. Although his wife thought for twenty-five years that he could read, even if he couldn’t read well, she didn’t know that he could hardly read at all until she overheard him trying to read a simple child’s story to their three-year-old. It was not until then that she came to understand the emotional pain he had been living with all those years. He suffered emotional pain caused by feeling there was something wrong with him which prevented him from learning, by having to develop so many coping methods to hide his illiteracy, and by feeling alienated from his associates who could read. 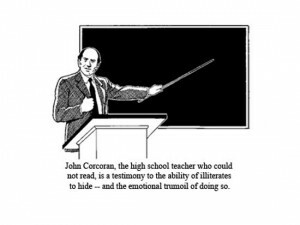 Mr. Corcoran told of how all through grade school and high school his teachers never once heard him read or spell a word correctly, and yet they continued to call on him to read and spell as if they hadn’t noticed. Throughout his public school years, not one teacher ever offered the one-on-one help that he so desperately needed, perhaps out of fear that, like so many of his previous teachers, they would be unable to help him, or because they were busy with other tasks. He explained that the U.S. is in denial — the public in general and teachers in particular are too embarrassed to admit the scope of our illiteracy problem. Mr. Corcoran said that, to hide his embarrassment over being unable to read in elementary school and high school, he became the class clown “having too much fun to waste time on learning to read.” He said that other nonreaders he knew were just as disruptive. As testimonial letters for i.t.a. (Initial Teaching Alphabet) in Sir James Pitman’s book, Alphabets and Reading, point out, the frustration of feeling stupid or inferior usually results in discipline problems. Students would rather be considered a tough troublemaker not interested in reading than be seen as trying and failing to learn. Mr. Corcoran explained that being unable to read causes very low self-esteem, and the only way to build up the nonreaders’ self-esteem is to teach them to read! As he stated it, “A crying child begs, ‘Tell them not to hurt us anymore-teach us to read!’” Mr. Corcoran said he feels strongly that every American who can read-in particular, every teacher-has a moral obligation to help their fellow citizens learn to read. When Mr. Corcoran was forty-eight years old he finally decided to try, once more, to learn to read. It took a little over one year of one-on-one tutoring to bring him to the equivalent of an eighth grade education. He then went through four years of self study and then another hundred hours of intensive training to bring him to a college level of skill. Grammar and spelling problems top the list of complaints that employers and college professors have about recent high school graduates. Next on the gripe list, according to a poll released Thursday by Public Agenda, is the grads’ inability to write clearly. . . .
Seventy-six percent of professors and 63 percent of employers say a diploma is no guarantee a student has learned the basics. . . .
Illiterates are a silent minority. They do not write to their legislators. They can’t. Out of embarrassment they do not lobby in their behalf. They don’t want to be known as a part of the illiterate minority. Community and cultural leaders of groups with large proportions of non-readers do not like to call attention to these members’ illiteracy. They fear this will give their “enemies” (racists, the “elitist” wealthy, or other class-conscious persons) ammunition to use against them. Since they are silent, they (like the reading majority) do not realize that millions of others are in the same condition. If they knew, they might be less embarrassed to stand up for what is best for them. An earlier report by the U.S. Department of Education quoted students who were asked to rate their abilities in math and science; 68 percent said they were “good at math.”(14) These were students who had just ranked near the bottom in international scholastic testing in science and math. Many believe that the U.S. is a highly literate society because of the official U.S. Census Bureau reports. The 1970 and 1980 census reports showed America to be 99 percent and 99.5 percent literate, respectively. In the interest of national pride, our governmental leaders like to present us as highly literate. Also, it is in the short-term interest of teachers and education officials to believe and promote belief in these figures. Conscious deception may not be taking place, but let’s look at exactly how the Census Bureau obtained these figures. The Census Bureau included questions about literacy in each census from 1840 to 1930. Many of those most knowledgeable about U.S. literacy believe that literacy began to drop in 1963 and has been declining ever since. The Census Bureau reintroduced questions about literacy in 1970 at the insistence of the military. In the 1970 census the only question asked about literacy was on grade completion. The Census Bureau considered those with fifth-grade completion or higher to be literate. A little more than 5 percent reported less than a fifth-grade education. For some reason, the Census Bureau decided that 80 percent of these could read, so they reported 99 percent literacy. 1. Illiterates would not respond to written forms, and their family members — likely also to be illiterate — would not either. 2. Because of unemployment or low-paying jobs, fewer illiterates have telephones. 3. 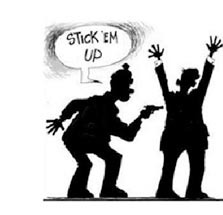 The underprivileged poor, and especially illiterates, may feel they are being singled out like criminals. They therefore have cause to distrust salespersons, bill collectors, or strangers knocking on their door seeking information — especially if the answers to the questions would be embarrassing. Home visits by Census Bureau officials who are not known by the person answering the door cannot be expected to yield accurate information under such circumstances. 4. Grade-level completion does not equal grade-level competence. Finally, this is an age in which we see one kind of crisis or another on TV nearly every day. As a result, we have a tendency to suffer from sensory overload. We learn to ignore or disbelieve much of the bad news because the world goes on with little visible effect. Also, far too often a radio or TV report we hear will dispute the seriousness or the truth of the previous day’s report. The study tests adults in three types of abilities, prose, document, and quantitative, very basically: reading, working with forms, and doing the arithmetical calculations they need to “get by” in life as well as they should. Figure 2.7 on page 63 of the 2002 version of the report lists the percentage of adults, by literacy level, who are employed full time, employed part time, unemployed, and out of the labor force (many of whom gave up looking for a job after years of being unsuccessful). Each of these data points were shown for prose (P), document (D), and quantitative (Q), so the first step is to average the three for each literacy level and employment situation. Level 1 calculations are shown; other literacy levels are calculated the same way. $88,458,105,000 divided by 42,022,000 = $2105 yearly average. 1. Michael Harrington, The Other America, rev. ed. (New York: Macmillan, 1969) as quoted by Jonathan Kozol, Illiterate America (New York: New American Library, 1985), pp. 12, 228. 3. Carman Hunter and David Harman, Adult Illiteracy in the United States (New York: McGraw-Hill Book Company, 1985), p. 37. 4. Edward Klein, “Everything Would Be Better If More People Could Read,” PARADE, May 21, 1989, p. 5. 6. Florida Judge Charles Phillips, cited by Laubach Literacy International, Inc., and the Washington Post, November 25, 1982, as quoted by Kozol, pp. 226, 229. 7. Hunter and Harman, p. 51. 8. Rockowitz, Murray et. al., Barron’s GED High School Equivalency Exam, 14th Edition, (Hauppage, New York: Barron’s Educational Series, Inc., 2007), p. 3. 9. Hunter and Harman, p. 43. 10. Kozol, pp. 24, 25, 28. 11. Ibid., pp. 23-25 and 28. 12. Sanford S. Silverman, Spelling For the 21st Century (Cleveland, Ohio: self-published, 2003), pp. 37-38. 13. Kozol, pp. 14 and 23-28. 2. Diane McGuinness, Ph.D., Why Our Children Can’t Read (New York: Simon & Schuster, 1997), pp. 7-8. 4. Mary Jordan, writer for the Washington Post, “Nearly Half of Adults in America Lack Necessary Literacy Skills, Study Says,” The Salt Lake Tribune, September 9, 1993, p. A1, col. 2-3. 7. Anne C. Lewis, special to the Baltimore Evening Sun, “Press Misses Scary Story In Failing to Cover Literacy Adequately,” The Salt Lake Tribune, September 14, 1989, p. A17, col. 2-3. 8. Joe Rolando, “Forum Sees Poor U.S. Education As Threat to Competitiveness,” The Salt Lake Tribune, July 12, 1989, p. D5. 11. Arnold Kling, “College Illiteracy,” the Washington Post, December 26, 2005, posted on the Internet at the website: College Illiteracy. 12. Gannett News Service, “New High School Grads Can’t Write, Say Profs,” The Salt Lake Tribune, January 9, 1998, p. A12, col. 1-2. 13. U.S. Department of Education, Office of Educational Research and Improvement, Adult Literacy in America, September 1993, as quoted by Dr. William Bennett, The Index of Leading Cultural Indicators (New York: Simon & Schuster, 1994), p. 88. 14. U.S. Department of Education, National Center for Education Statistics, International Assessment of Educational Progress, A World of Differences, 1989, as quoted by Dr. William Bennett, p. 85.